The season has not even started yet and Arsenal are already in the midst of a crisis. Per Mertesacker picked up an injury nearly 3 weeks ago which ruled him out until 2017. With Laurent Koscielny only just back in training, Mertesacker’s injury left us with just one senior centre back to start the season. Accident prone Gabriel. And it was all a little bit predictable wasn’t it. 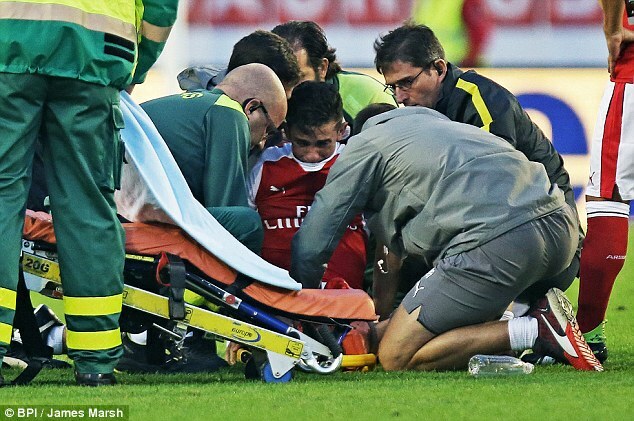 In the 91st minute of the final friendly, Gabriel go’s into a nothing challenge, studs get caught in the turf, and reports indicate his season is over before it has even begun. It leaves us in a situation where against Liverpool we are either going to have to start with youngster Calum Chambers and new boy Rob Holding, or play Nacho Monreal or want away right back Mathieu Debuchy at centre back. Some might say we have been unlucky to get injuries in two senior centre backs. That is correct, we are unlucky, but we are also negligent. Before the window opened, centre back is a place we all agreed needed improvement. Per Mertesacker can not defend from the halfway line, and Gabriel simply can not defend. My thoughts were simple. Buy a partner for Laurent Koscielny. Per Mertesacker becomes 3rd choice. Gabriel get’s shipped out. And either Rob Holding or (more likely) Calum Chambers go’s online to a Premier League side to play 38 games. That way we have a senior centre back partnership. A 100-capped international backing them up, and a youngster gaining experience and developing. Obviously with Per’s injury, the part where Gabriel is sold does not happen. He stays as 3rd choice. With Mertesacker’s contract set to expire in 2017, it would then see us have the new centre back, Koscielny, Chambers and Holding as our options. It is so simple on paper. But we have not moved for a centre back. Even with Mertesacker out till 2017, there was no movement in the market. It was almost like we were happy with an inadequate Gabriel and an injury prone and not yet in training Koscielny to see us through the season. Now of course, we could have signed someone like Mustafi and he could have gone over against Manchester City and be out for the year. Injuries happen. But then at least then we still would have had Gabriel who could then partner one of the junior guys. To be in the situation we are less than a week before our 1st game of the season and we do not have a single senior centre back to call on is an utter disgrace. And it highlights the lack of leadership top down currently within the club. Starting at the very top, Stan Kroenke has been a hands off owner at Arsenal, unless it is time to put the hand in the cookie jar. I actually have no issue with an owner not getting too involved. We have seen numerous times throughout history an owner being too hands on with a club, and more often that not in ends in tears. Players being bought by an owner who the manager does not want. Owners going into dressing rooms to take team talks. Even owners dictating to the manager who should play. If you are not an expect in a certain industry, you should not get involved, even if you are the owner. The owners job is to put the right person in charge of running that business. For Arsenal, that man is Ivan Gazidis. Gazidis is another who seems to lack leadership. It is worrying that he is Arsene Wenger’s “boss” but it is Wenger who was involved in appointing him. Does Wenger report to Gazidis? Or does Gazidis report to Wenger? Whilst David Dein is certainly someone I do not want involved in Arsenal anymore (if you think he is the messiah, learn your Arsenal history), there has certainly been a lack of leadership since he and Keith Edleman left the board. Dein and Edleman got the job done. They pushed Arsene Wenger. Demanded the best from him. Gazidis does not do that. It should be Gazdis’s job to force the hand of Arsene Wenger. Tell him that we need to be buying the best. Let him know recent performances in transfer windows have been unacceptable. Our recent transfer dealings have been embarrassing. Both in terms of getting players in, and attempts to get players in. The negotiating team are clearly not doing their job. The manager not picking his targets. And both of these report to Gazidis. He needs to be leading the club over the summer transfer window, but he seems to disappear. Maybe he is scared to challenge Wenger? Scared that the man below him who hired him could fire him. And then we come to Arsene Wenger himself. We all know, deep down, he, not Gazidis, runs Arsenal Football Club. The buck stops with Wenger. His leadership of the club over the last decade or so has been underrated by many. He led the ship through the choppy waters or a financial crisis which saw the club unable to compete to keep its best players, let alone compete for top ones. But that ended 3 or 4 years ago. And he has not changed his ways. Arsenal are no longer poor. But Arsene Wenger acts like we are. He is like your lottery winner who still buys Tesco Value noodles. He seems to settle for mediocrity. Settle for just getting by doing the minimum possible. And that filters down to the players. Players who celebrate finish 4th. It is not good enough. Finally we come down to the players. There is actually a good handful of leaders in the playing squad. Sanchez, Cech and the new boy Xhaka have all captained club and / or country at points in their career. So to be sitting here, less than a week before the season starts, and not have a club captain is an utter disgrace. 13 Premier League starts by Arsenal’s captain in the last 3 seasons. It really is an amazing stat. And once again there are question marks over who should be captain. At one point it looked like Per Mertesacker would be given the armband, after all he was Mikel Arteta’s vice-captain. But with a question mark over his place in the first XI, it would once more be a case of the club captain not starting. His injury ruled him out of the running. Next in line seems to be Laurent Koscielny. But is he a leader? He has never been a captain, and is not the most vocal on the pitch. You feel he would be getting the armband due his longevity at Arsenal, not due to his leadership ability. The net result is Arsenal do not currently have a club captain. We are leaderless. From the top down. The boardroom, the training ground and on the pitch. Ps: Today the blog (this form) is 3 years old. In that time we have had over 2,000,000 hits. A big thank you to every contributor, and every reader. This entry was posted in Arsenal and tagged Arsenal, Gabriel, She Wore, She Wore A Yellow Ribbon on August 8, 2016 by keenosafc. You got it all worked out. if Wenger is on 8m you must be on at least 16m with your knowledge . Is 3 years the age of the blog or the age of you. Why are you upset that a player by your own admission can’t defend has got injured. Calm down for God’s sake…..and get your facts right. So the club wont spend….Ozil? Xhaka? Alexis?….did someone give them to the club? Yes, we need another CH but please tell the world who and is that “who” available. No matter who is signed you can be sure that it will be met with sneers because we did not spend 100,000000 and he would be too small, too slow, too young, too old,etc, They had good win yesterday so perhaps a bit of praise would be appropriate, but don’t worry, just leave that to those who support the Club.